Earlier this year Access PR founded Access Cares in response to the requests of employees looking for opportunities to contribute to their communities alongside their teammates. Earlier this year Access PR founded Access Cares in response to the requests of employees looking for opportunities to contribute to their communities alongside their teammates. In December the agency's holiday initiatives will include New York Cares' Winter Wishes and Adopt-a-Family in San Francisco. In San Francisco, Raphael House provides family services through their residential shelter program and follow-up services that support and empower parents. Adopt-a-Family is one of these programs, helping families during the most financially demanding time of the year. Working with community partners, Winter Wishes provides holiday gifts to disadvantaged children, teens, seniors, and families who would not otherwise receive gifts during the holidays. In light of the devastation of Hurricane Sandy, Access wanted to bring some holiday cheer into the lives of people working to rebuild. Winter Wishes collects more than 35,000 gift requests and forwards them to volunteers who purchase, wrap, and send the gifts. 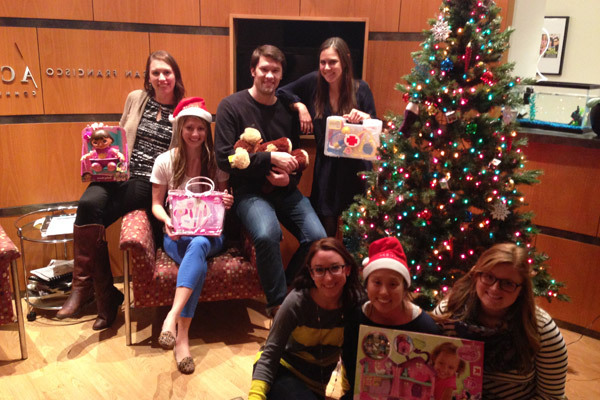 This year the Access Cares team had the opportunity to fill the wish lists of two families. “After Hurricane Sandy, staff in the New York office really wanted to help out families in need around the city. We found New York Cares' Winter Wishes through employees who participated in years past and thought that it was the perfect way to get involved with the community over the holidays. Once those letters started trickling in from children and senior citizens and we heard the reactions around the office as they were read out loud, we knew it was the right choice,” said Access employee Janet Park. The team is pictured here with some of the gifts they purchased – including pajamas and a robe requested by one family's grandmother, as well as a doctors kit and a Dora the Explorer doll requested by two little girls. The office really enjoyed fulfilling their gift wishes.